This is a story told in footprints down the beach, thrown-off clothes and the laughter of friends . . . The evening the Pilgrim Woman told this tale, the Old Chapel was spotless and smelled of rosemary. She perched on the third-to-the-bottom-step of the stairs to the garret. A large and tatty haversack lurked behind the ancient timbers. She turned to the other listeners; the fishermen and shopkeepers, the cafe owners and runners of arcades. Some still wore their aprons. Held cups of tea in rough hands. Had come straight from work. Where d’you think you’re goin, sonny Jim? To the beach for a swim, sir. Not on my watch you’re not – nor anyone else’s. Come here and have a gander at that lot. Want to get your trunks caught on that barbed wire, lads? Or stub your toes on hidden concrete? Nah – I thought not. All out-of-bounds now. Oh sir – what for? The Jerries – that’s what for. Stop Fritz invading. Yes – here. Don’t you kiddies learn any Geography these days? France is only just over the horizon. Yes, sir. Got something for you, sir. Haven’t we, Bert? Mmm – looks proper official and all that. Go on then – but for goodness’ sake don’t go outside of the safe area. The warnings are there for a reason – I don’t want to be picking you lads up in kit form later. Yes sir , we’ll take care , sir. Forget my trunks, didn’t I? Wouldn’t worry about that. Guard’s too busy having a ciggie to bother about us. We can skinny dip. What – you forgot yours too? Never brought’em. No-one to see – why bother? Oh my giddy aunt – there’s Beryl and Lil. Get down! Hello lads – glad to see you’re enjoying the sunshine – all over. Nudges and winks and chuckles passed around the listeners. They all knew Beryl and Lil, Jim and Bert. ‘Last tale?’ The Lord-beside-the-Sea tilted his head. She picked up her bag. ‘The Garret will always be open to you,’ the Lord-beside-the-Sea said. ‘Don’t leave – you’re one of us now,’ said the lad with the cheeky grin. Others asked if she couldn’t stay for a bit longer? Surely until the end of summer. She shook her head. Coins and bangles tinkled. Small, stitched mirrors winked with candlelight. 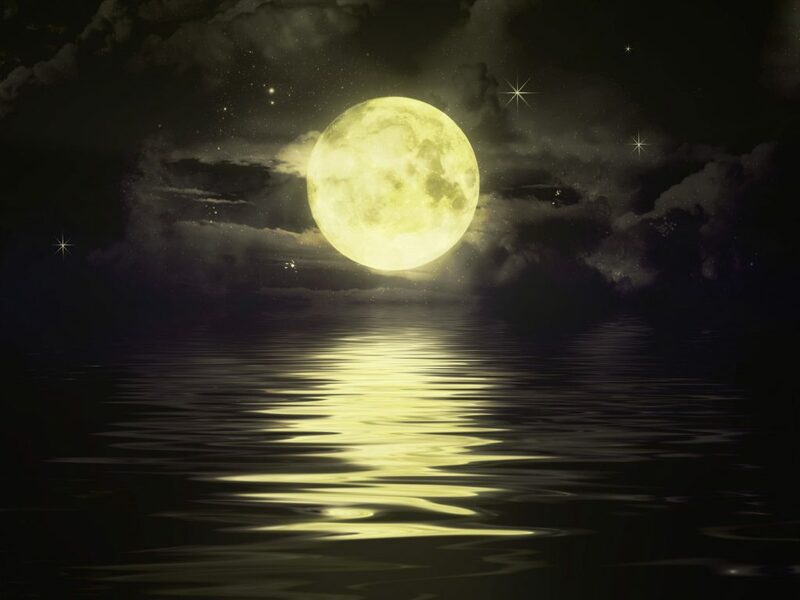 She walked out, over the dunes and along the path cast over the waters by a huge moon. This entry was posted in Fiction and tagged peppercorn story, Tales from The Garret by KMLockwood. Bookmark the permalink. Oh, Philippa, I hope this isn’t the last tale from the Pilgrim Woman? The dialogue adds an interesting layer and is funny, too. That’s not an easy thing to do. I love love the first part where the air has the scent of rosemary, not only my favourite plant and herb in real life, but in the tale, hits the senses straight away clearing the brain. Love it. Does she walk out onto the water? I don’t know, just magic. The Pilgrim Woman has been storyteller-in-residence for over a year. She may return one day – as if by magic. Thanks for taking the time to comment – much appreciated, Frances.